With the Bay Bridge closure, many have decided to take BART, mostly because of their frequent service versus the ferry boats that runs on a rigid fixed schedule that's not that frequent. There's a hot debate going on in the SFGate comments area regarding an article about an increase in ridership on BART due to the bridge closure and the problems with new riders to the system. Although I'm not one of the daily commuters on BART, I do understand basic transportation courtesy about that particular agency. One of the easiest things a rookie passenger should do is to visit BART's website and learn about the system, from where to transfer, how to register a parking space, and how much the fare is. By being prepared, you'll be ready for the commute. 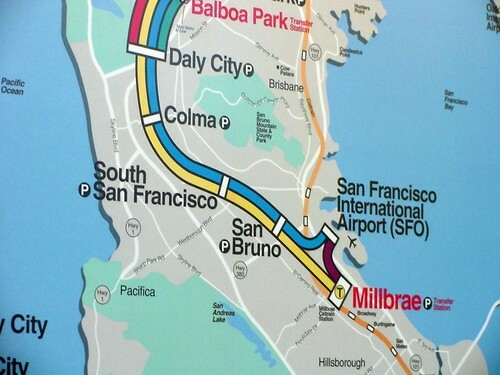 Always know where your nearest BART station is located and know the local bus routes to get there. If you need to take your car, you should review the BART parking maps, and their rules and regulations on their website. If you are getting dropped-off, don't do it in a bus zone. The cops love writing $250 tickets. The BART parking lots costs a little bit of money on weekdays, but are typically free on weekends and after 3PM on weekdays. If you must pay, remember your parking stall number and register it within the train station. If you want to get a guaranteed parking spot, always go on BART's website and prepay for a reserved parking space. Don't wait in line to buy a ticket at the machine, get a high value ticket at many of your favorite retail outlets. You'll eventually use up the funds. If you don't want to hassle with tickets, get a TransLink card. Always line-up before the train arrives. When the train arrives, move away from the doors and let the passengers exit first. The first person in line boards first, followed by the rest. If that's not your train, tell your passengers behind you to pass-by. The train is not a place to disrespect. Never eat food, drink beverages, hog more than one seat, clip your nails, make cell phone calls, fart (passing gas, dutch oven, etc. ), and don't sit in the seats for the elderly or disabled (unless if you meet that criteria). If the car you boarded is crowded, move to the next car. Don't be afraid to move to the next car while the train is in motion. Always be prepared to exit the train. When using the escalator, standees should stay to the right, and people walking up the escalator should stay to the left. With all this mumbo jumbo going on about how safe the bridge is going to be after they re-open it, why not stick to public transit? There's less pollution spewing in the air, traffic jams won't be so bad, and you save more money with a commuter benefits program. Lining up is for suckers. If you were supposed to line up there would be velvet ropes. I actually block people who don't stand in the queue and rush the doors when the train arrives. If you took time to notice, some downtown platforms have guides stuck on the tiles telling you where to line up. Go to DC or Rome or Paris, any Metro in the world, it's like that too.